My last post on Dec. 4, 2012 did NOT signal my return to blogging :)! The holiday season, my brother visiting from the United States, LASEK surgery and recovery….well, time got away from me! Here goes to a new attempt to post more frequently! I’ve fallen off the blogging radar this autumn because I was juggling a lot of commitments at once, including several big curriculum development projects (my freelance job), a short-term teacher certification class (CELTA) and graduate school applications. Things have finally wound down and I’m enjoying the new freedom in my schedule. I’m also hoping to start addressing the huge backlog of blog ideas and topics stored in my noodle, so stay tuned! I cannot believe over a month has whizzed by since I last blogged. This past month has been quite hectic since I’ve started a new job while also having to meet three major deadlines for some freelance curriculum development work. Another key development that has really kept my hands full is my newly rescued foster dog! I totally don’t remember where in the Getty we saw this statue, but I loved it! I just thought it was amazing to see this statue with such detail–and it was carved long before people could just take a snapshot to keep the facial expression frozen. Whoever, the model was for this sculpture, bravo! I think this would have been really tiring for the face muscles. I love that Yoongu was willing to duplicate the pose! Last May, Yoongu and I went to the San Diego Wild Animal Park for free, courtesy of my parents. They have memberships with the San Diego Zoo/Wild Animal Park, so that includes a bunch of complimentary tickets. Good thing too–since getting in for free encouraged us to splurge for a special “Segway” safari at $90 a pop—but well worth it since we had a lot of fun on our all-terrain Segways. I’ve also been on the regular (free) tram tour of the African plains, so going around on the Segways was really fun :)! All in all, it was a great day! Here’s a few pics of the wildlife (Yoongu is, I daresay, partly domesticated!). After the zoo, we stopped by an ostrich farm—That egg I’m holding is the equivalent of about 30 chicken eggs! We had it scrambled, and it was quite good. A lighter flavor and texture than chicken eggs, I thought… I initially bought it so we could share it with my parents, but they refused to eat it cuz they were so grossed out by the size! And not only was it huge, it was HARD! We had to use a hammer and nail to crack it open! After the ostrich farm, we stopped by Kim and Dan’s home to visit them and their adorable kids, Bradley and the recently born Maddy. That’s Kim’s reindeer candy poop dispenser I’m holding :)! Lastly, Yoongu and I took a nighttime stroll alond the beach in San Diego, and finally headed back to Chino Hills. What a long, but funfilled day! 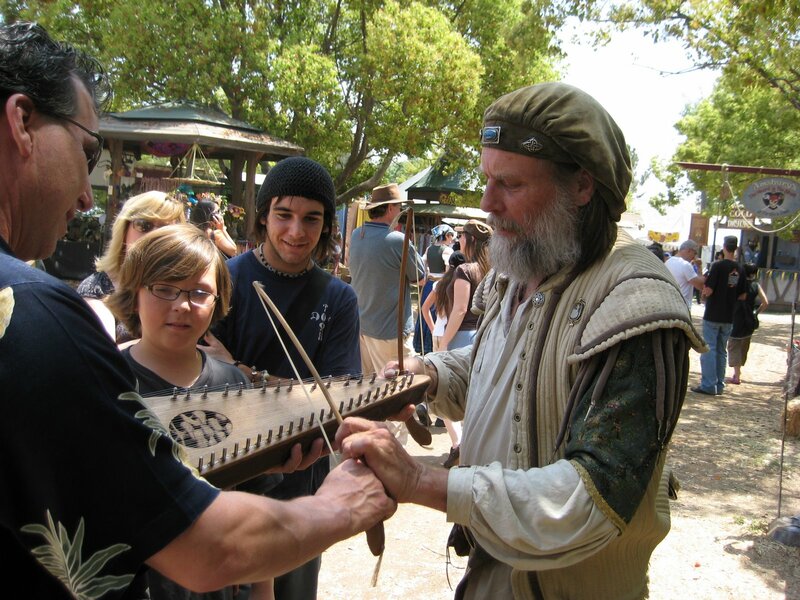 I was thrilled that our US trip coincided with the annual Renaissance Faire held in Irwindale, CA. I had a great time showing Yoongu around the medieval/renaissance-themed fair, and we both really appreciated the beautiful handicrafts we saw, including beautiful woodwork, glassblowing, ceramics and metalwork. Oops, I guess we also managed to squeeze in some time for public punishment at the stocks! Moonie was a *HILARIOUS* act that we both got a huge kick out of! Aw—our knight lost the joust tournament, but we still had fun watching! We finished the day by listening to this band, The Dread Crew of Oddwood, and it was a blast! It was an awesome musical crew of pirates! Spring 2009 US Trip: DARN WABBITS! Yoongu and I stayed at my parents’ house for most of our stay. For those of you who have been to our house, then you’ve seen the size of my parents’ beautiful and spacious backyard. Well, admittedly, it takes a lot of work to keep that backyard looking good. Of course, my parents have gardeners, and they also spend a good deal of time out there, but there’s one thing that is the bane of their existence: Rabbits. It’s not so much that they eat the grass: it’s that wherever they poop grass turns yellow and dies. So, they have this horrible task of cleaning up after the rabbits if they want their lawn to look good. 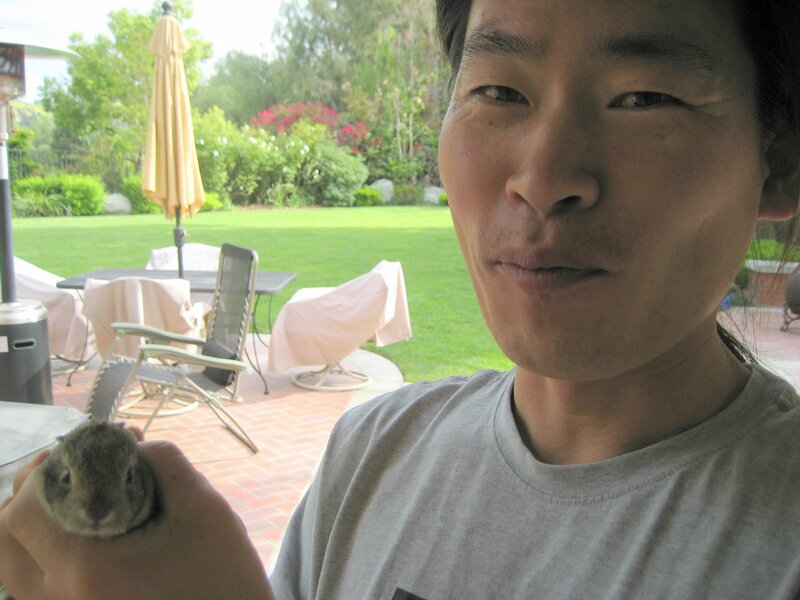 One day, when Yoongu was revamping my mom’s veggie garden, he caught something: A baby rabbit! I went out to check the garden, and lo and behold, we managed to catch a total of three baby rabbits! Now, they were really really young. Yoongu said that they hadn’t left their mom that long ago. That must be why they were so easy to . Anyway, who knew, but rabbits can scream: they made an awful ruckus when we held them, so we put them in a brown paper bag until we could figure out what to do with them. Now, I thought they were the cutest things imaginable, but my mom hated the very sight of them, and wanted us to get rid of them. So we took them to our local park and set them free there. Bye bunnies!